Star Trek fans are about to get an opportunity to see a chapter from Captain Jean-Luc Picard’s history 20 years before he took command of the USS Enterprise in Star Trek: The Next Generation. IDW Publishing today announced Star Trek: IDW 20/20, a special one-shot issue that flashes back to Picard’s time commanding the USS Stargazer. The issue is written by Peter David with art by JK Woodward. "Twenty years before he took command of the U.S.S. Enterprise-D, Jean-Luc Picard sat in the captain’s chair of the U.S.S. Stargazer. Picard served with distinction aboard the Stargazer for many years on his way to becoming the most respected captain in Starfleet. But in this early mission, Picard shows us a vulnerable side as well as glimpses of the brilliant tactician he would become." 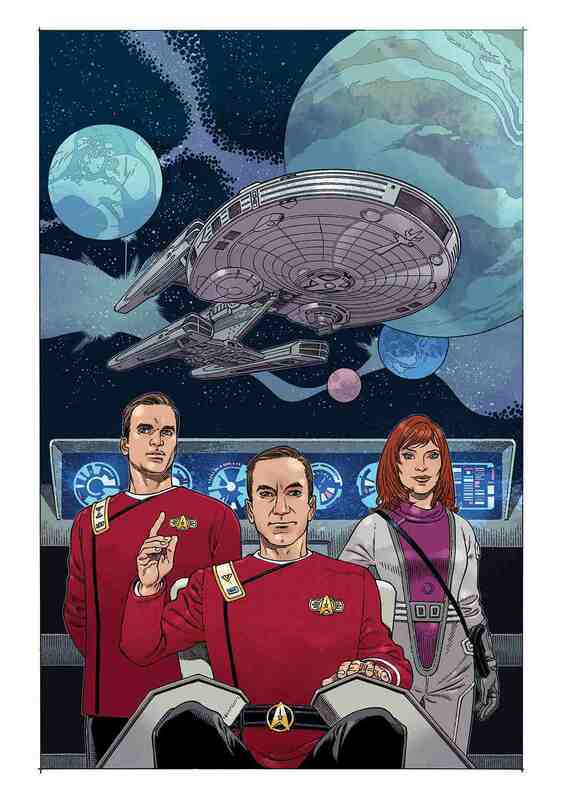 The cover shows a younger Picard in the Stargazer’s captain’s chair with Beverly and Jack Crusher, Wesley Crusher’s parents, standing over his shoulders. David is a veteran Star Trek writer, having written the ongoing Star Trek comic book series when the license was with DC Comics. He’s also written several Star Trek novels including the fan-favorite Imzadi and the New Frontiers series, which he also brought to comics. JK Woodward has collaborated with David previously on David’s Fallen Angel series. He’s been a staple artist for IDW’s Star Trek line, drawing the crossover Star Trek: The Next Generation - Doctor Who: Assimilation², Star Trek: Harlan Ellison's The City on the Edge of Forever based on the writer’s original script, and Star Trek: The Next Generation - Mirror Broken. The Star Trek one-shot is part of the larger IDW 20/20 weekly event, celebrating IDW Publishing’s 20th Anniversary. Each IDW 20/20 issue takes a different pop culture property that’s being published by IDW and tells a story set either 20 years in that universe’s past or 20 years into its future. The other participating properties are Teenage Mutant Ninja Turtles, My Little Pony, Ghostbusters, and Jem and the Holograms. Are you excited for Star Trek: IDW 20/20? Let us know in the comments! Star Trek: IDW 20/20 goes on sale in January 2019.